The Xbox 360 Console with Kinect. Kinect brings games and entertainment to life in extraordinary new ways - no controller required. 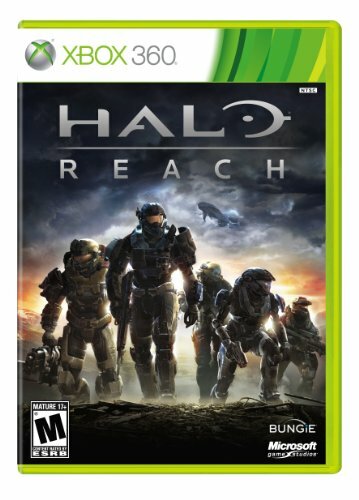 In Halo: Reach, the blockbuster prequel to the Halo trilogy, experience the events that transpired on the planet Reach. For the first time, players will fight alongside a squad of iconic Spartan soldiers, each with deadly talents as unique as their individual personalities and customized gear Live the events that set the stage for the Halo trilogy as the UNSC and Covenant clash at the height of their military power. Halo: Reach takes a massive leap forward through all-new engine technology designed to take full advantage of next-generation graphics, audio, special effects, AI and animation Halo: Reach builds on the success of its predecessors, setting a new standard for competitive game play, customization, variety and community integration. Halo: Reach expands on the industry-leading suite of features found in Halo 3, including four-player cooperative. Bigger Better Bolder Badder WWE All Stars delivers an all-new take on WWE with fast, fun, fluid and furious arcade-style game play that takes WWE action to the next level. Featuring your favorite colorful WWE Legends of the past and larger-than-life WWE Superstars of today, WWE All Stars delivers the greatest roster ever assembled in a WWE videogame. It’s up to you to determine the greatest of all time in the revolutionary new addition to THQ’s WWE videogame portfolio and debut release from THQ San Diego.